I was watching Star Trek — the early episodes — with the family a couple weeks ago when it occurred to me: Silicon Valley has got the lesson of the Star Trek computer all wrong. This is what happens when you live in a town without history. The Star Trek computer, at least in the 1960s, was not ahead of its time, but *of* its time. It lacked the vision to see even five years into the future. It’s hard to get a good shot to demonstrate this, but here’s a couple to give you an idea. These are from the Omega Sector fan site. But this profoundly misses the point. 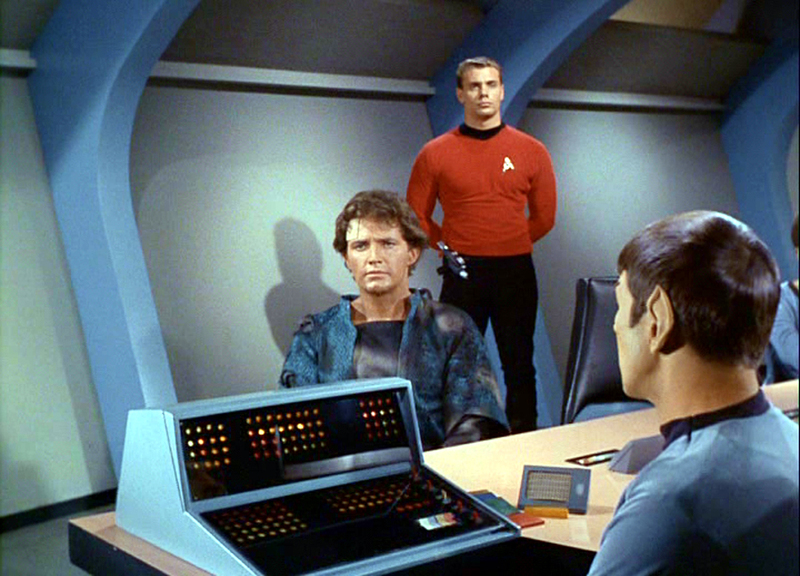 Captain Kirk never pulled out a keyboard, because the idea was that computers were not meant to be messed with by users. They were instrumentation, for doing advanced sorts of mathematics and using it to decide which colored bulb to light. There’s no keyboard because there is no text, anywhere, on any computer on the Enterprise to edit. And the reason for this was that in the 1960s people thought using computers for text processing was ridiculous. You see this in the history of hypertext. Andy Van Dam, who built pioneering text editing systems at Brown in the sixties was reduced to begging for time on the Brown computers. Why? Because computers were for math, stupid! The scientists at Brown laughed at him. Star Trek is not a post-keyboard world, it’s a pre-keyboard one. You would think a company that makes its money processing the billions of lower-case non-BASIC words that have been typed into computers since then would get that. So what happened? What changed? Well, for one, we started type text into computers. But something bigger happened as well. Because text editing became a way of thinking about computers. You see this when Alan Kay starts talking about the DynaBook vision in the late 60s and early seventies. He starts by saying, look, you could have some text on this, and you could edit it. And you could swap out different fonts. And then he thinks, well, music is really the same thing as text, isn’t it? Strings of characters produce documents the way that strings of notes produce songs. When you “display” a song, you play it. So you could edit sequences of notes and play them without being able to play an instrument, in a kind of text editor for music. And he goes further. The same way you switch fonts, you could switch the sounds. You could try your composition as played by something trumpet-eque, and then switch it to organ, without redoing the composition. The way you can edit fonts you could edit timbre in the different sounds. And pulling from ideas like Sutherland’s SketchPad he moves to notions of editable models, he imagines a user-created model of hospital throughput. You set your assumptions about time per patient, and how patients move through different departments. Then you fool around with staffing by adding or subtracting staff from different departments and see where bottlenecks emerge. And in his mind, this changes communication, and allows us to communicate in new ways. Now when I want to send my manager this week’s staffing, I can send them this dynamic document. Do they disagree with the staffing? Well, the document is open. They can change the staffing and see what happens. They can look at the assumptions and edit them. We have a conversation back and forth through editing the model. And you can do this with everything — you send me a song you wrote, I like it — but wouldn’t it be nice to add some resonance to that viola? Now, having just seen this episode, I can tell you that Kirk has discovered that this dude who is a travelling actor might just be an infamous war criminal. This is pretty important, the sort of observation that Star Fleet Command will want to have in their files. So Kirk edits the file, noting…. Except that he can’t edit this file. 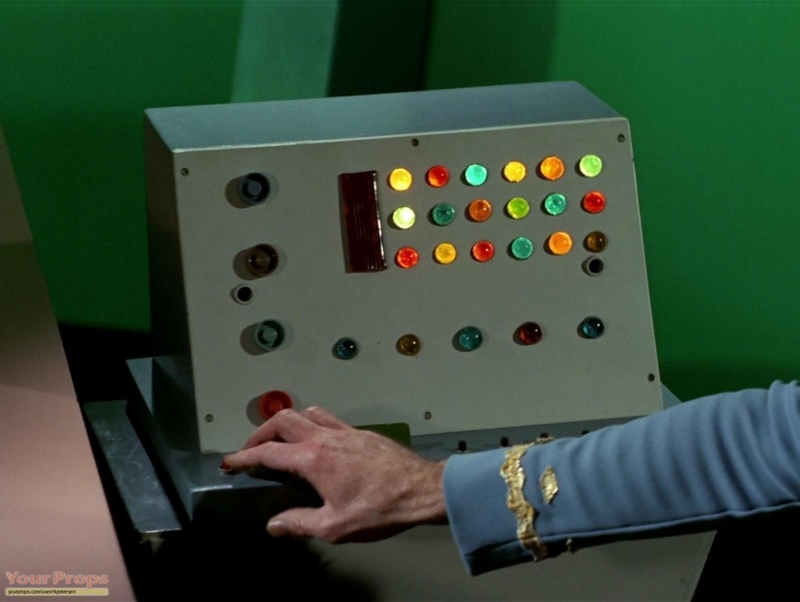 In the Star Trek world information goes into the computer and comes out of it, but nothing can be edited. He can tell the computer, I suppose. And then the computer can decide whether to splice that into the next presentation or not. But editing? Other computers are similar. Here is an Omega Sector reconstruction of a command and control system. Now I imagine the way this works is this. The lights show you various information and projections about the performance of the ship. Based on those you can alter the flow rate, jettison fuel, or do two other things I don’t quite get. But what if I want to change the model? What if I want to know what those lights would look like if we reduced load by dropping half our cargo? Or if the computer’s assumptions about oxygen consumption by the crew turned out to be too optimistic? 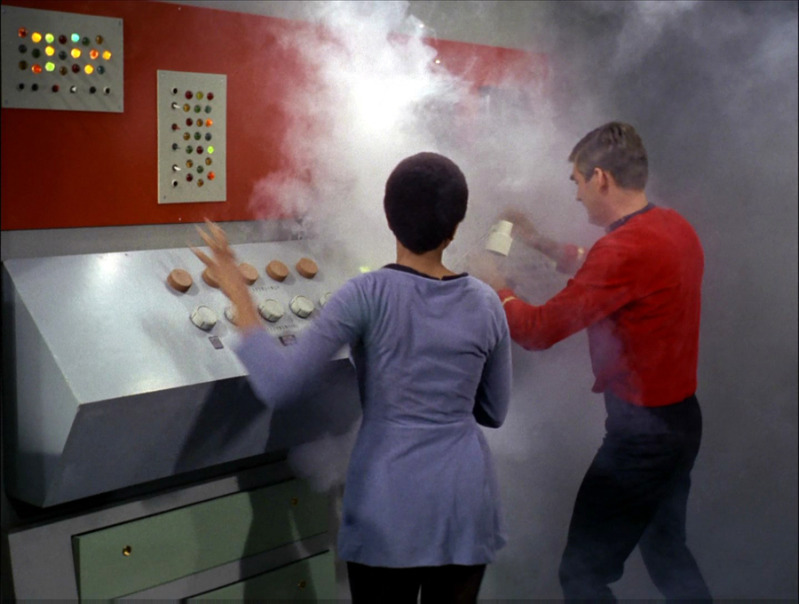 What if, discovering an oversight in the assumptions, I wanted to distribute the new model to Star Fleet Command? Again, I have no way to find that out, because I can’t edit, I can’t distribute. These computers are centuries ahead, in some ways, but they are already behind the vision the pioneers of personal computing were imagining at the time. 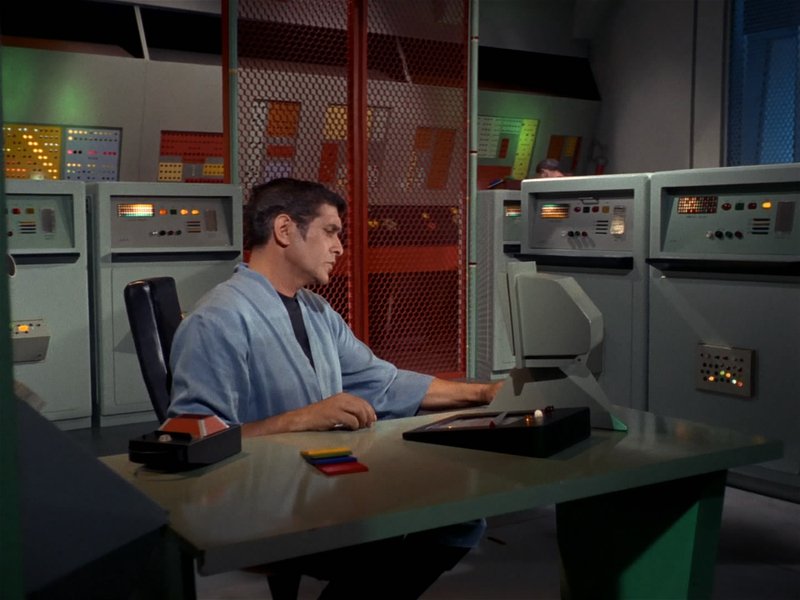 Vulcan intelligence may be unparalleled in the universe, but the equipment Spock uses reduces him to a switch flipper. It’s this vision of a population of computer “operators” (a vision that was the most common at the time) that guides the portrayal of Enterprise technology, and renders it so quaintly 1960s, so non-textual, so I/O. So the question we have to ask ourselves is how Silicon Valley came to see the Star Trek computer as a vision of the future, rather than an artifact of a pre-Kay, pre-Engelbart world. I don’t have easy answers to that. One possibility is they see the personal computing era as an anomaly. We edited our documents because computers weren’t smart enough to produce and edit documents for us. We edited assumptions in Excel spreadsheets because computers weren’t yet trustworthy enough to choose the right formulas. Soon computers will be smart enough, and Star Trek can commence. Another is the scale of ubiquitous computing. Perhaps there is a belief that in a universe where everything is a computer, the prospect of having time to mess with parameters is just too overwhelming. There’s some validity to these arguments, though it’s worth noting that these beliefs are identical to the beliefs of the average 1960s computer scientist. Computers were smart enough and numerous enough for them to believe that the future could be hard-wired in the 1960s. And they were dead wrong. There’s a third possibility, though, and one that scares me quite a bit. And that’s that they are unfamiliar with how Star Trek’s technology vision was proved wrong. In the end, perhaps it doesn’t matter. Either the personal computing revolution can be rolled back (as it has been in many ways in the past few years) or we can push forward and see what happens. It serves the interests of the Google’s of the world to make their computers dynamic and your interface static, because dynamic means control (it’s not for nothing the term comes from the Greek for “power”). For better or worse, Google, Apple, Facebook and others all are building the “ideal version of the Star Trek computer”. If we want to move past these quaint, archaic notions, it’s up to us to build something else. I’m curious, then, about your thoughts on the effect of ST:TNG on the industry. If the original series is the “pre-keyboard” world, as you say, would TNG be a reflection of a post-keyboard world, with virtual keypads and tablets and touchscreens everywhere? It seems to me that Apple is really aiming for that more, with multi-function devices that have minimal physical interfaces, since they’ve historically been focused on hardware. Great website! I came originally from Bret Victor’s twitter post on Federated Wiki.